SAS is the popular analytics tool in today’s world. SAS is easy to learn and provides easy for PROC SQL and it suits for data management, advanced analytics, business intelligence, predictive analytics, predictive analytics and much more. It is developed by SAS Institute and it provides a graphical user interface for more advanced options and technical users through SAS language. 2. What is Base SAS? Base SAS is text-based and basic IDE with the older interface. It assists to write a code for the various process. 3. What is the use of SUBSTR function? A SUBSTR function is used to extract string or replace the content of character value. 4. What are the capabilities of SAS framework? Manage – User can manage their data with security. Analyse – User can perform simple analyses frequency, it includes forecasting and regression. Access – SAS allows you to access data from multiple sources like Oracle database, raw database, SAS Datasets and Excel file. 5. What are the features of SAS? What is the function of output statement in SAS program? You can use output statements for summary statistics in data sets. It is used to create customized reports about the process. 7. What is the function of stop statement in SAS program? Stop statement helps to stop the process immediately. It also helps to resume the work in a short duration. 8. What is the difference between drop and data set option is set and data statement? If you want to process certain variables and it doesn’t want to appear in new data is considered as drop and data set option in data statement. If you don’t want to process certain variables and it doesn’t want to appear in new data is considered as drop and data set option in set statement. 9. How many data types are in SAS? Character and Numeric are the two types of SAS. 10. Difference between PROC SUMMARY and PROC MEANS? PROC SUMMARY produces statistics for all subgroups, it also helps to sort data by variables. PROC SUMMARY doesn’t produce any data for your output. PROC MEANS produces statistics if you use the BY statement. 11. How to delete duplicate versions in SAS? There are two ways to delete duplicate versions in SAS. 12. What is the difference between input and put function in SAS? 13. What is the length assigned to target variable by scan function? 200 is the length assigned for target variable by scan function. 14. Name some SAS functions? Index, find, Sum, Scan, Catx, Trim and Substr. 15. What is FORMAT and INFORMAT function in SAS? INFORMAT – A number should read in a particular format. Get start to learn analytics, people who need to analytics can reach out SAS Training in Chennai. 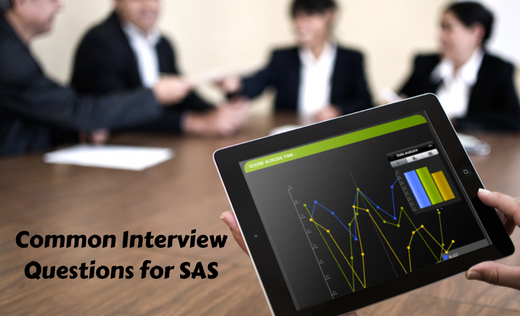 With SAS knowledge you can write reports, app development, improve quality and much more. Every day you have to update yourself with current innovations, without learning new strategies it is quite difficult to survive in this world. Enhance your analytics skills and proficiency through SAS course in Chennai. Learning analytics will help the candidates to achieve a great profession. Thank you for posting this valuable information. I am going to attend for SAS developer, it is very useful to me.